Back when Mark Wahlberg was hanging out with guys who called themselves the Funky Bunch, nobody would ever have guessed he’d end up one of the most admired and adored dads in Hollywood. But the superstar eventually reached back to those family roots that ran deep for him as the youngest of nine kids. Now, the actor is starring in a movie that’s all about family, specifically adoptive families. 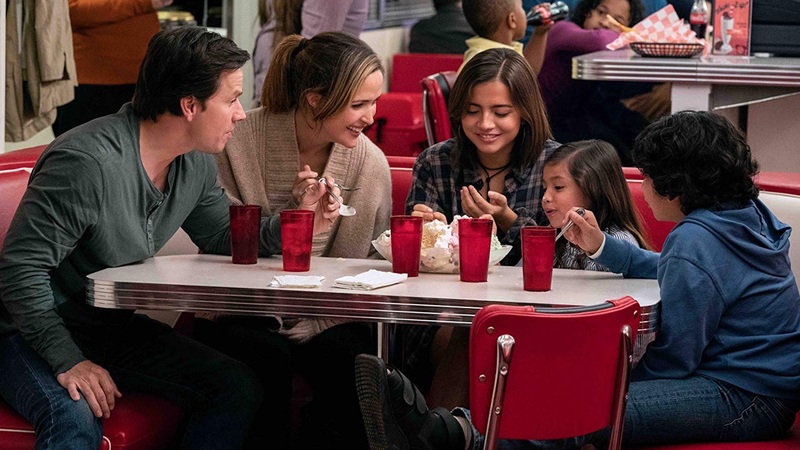 Instant Family stars Wahlberg and Rose Byrne alongside Isabela Moner, Gustavo Quiroz and Julianna Gamiz as their adopted children. Octavia Spencer and Tig Notaro round out the cast. Some of Wahlberg's funniest roles, like Daddy’s Home, are ones that pair him up with kids, but it's not just his on-screen persona that has endeared fans over the years. Fatherhood is a role Wahlberg has a lot of experience with. The actor has four children with his wife Rhea Durham and has become somewhat of a poster dad in the public eye when it comes to dealing with relatable fatherly situations. Here are all the best real-life moments when Wahlberg played his dad role to hilarious, sweet and even embarrassing effect. Wahlberg has been known to post a lot of workout videos, many of them shirtless. But after filming for Instant Family, Wahlberg jumped right into training for The Six Billion Dollar Man, and his own family'd had just about enough of his social media behavior. When he gave a pitch for the protein water he likes to drink while flexing his bicep, his wife could be heard judging him from across the room. “Baby, stop doing videos with your shirt off,” she said. His little girl, also in the gym, giggled and added, “Yeah, dad.” Burn. Ellen DeGeneres has the kind of sense of humor that brings celebs down to earth. When Will Ferrell and Wahlberg joined her during promotion for Daddy’s Home 2, she brought an 11-year-old whiz kid on to do a little quiz against the superstars. Wahlberg went out aggressive, getting in the face of little Zachary Rifkin to warn him: “We’re watching you… don’t play no games. But the wunderkind wasn’t having it. “You guys think you’re funny,” he said before schooling them on everything from planets to spelling. Hailing from Boston, nobody is as big a New England Patriots fan as Wahlberg. Even though he scored tickets to the 2017 game in which the Patriots took on the Atlanta Falcons, Wahlberg wasn’t there to see the final score live. He had to leave early to take his sick son home. But as he said in his post, family first! In the run up to Ted, Wahlberg went on Conan to discuss what made him interested in the movie. He explained that after he read the script, he was told to watch Seth MacFarlane’s Family Guy, and thinking it was a cartoon, watched it with his kids… which didn't go over too well with his wife. “I’ve been on punishment more than my kids,” he said, referring to their ongoing hijinks. Despite all that, it seems pretty clear Wahlberg's a loving and devoted dad. Look for him costarring in Instant Family, which hits theaters on Nov. 16.